All racquets are different. Even two brand new identical models from the same manufacturer will differ slightly in weight, balance and flex. 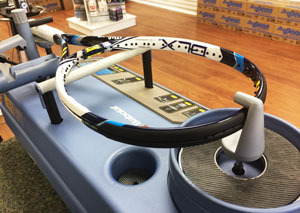 Racquets lose integrity and stiffness with years of use, and eBay is FULL of counterfeits that look perfect but play terribly. 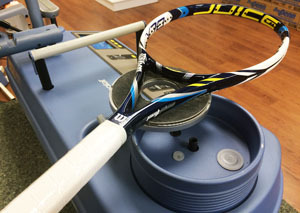 These important properties of a racquet can only be determined by a knowledgeable racquet tech using specialized equipment. 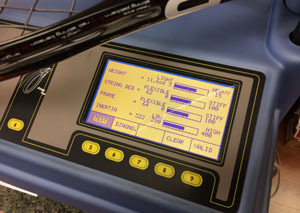 At Wrigley’s Tennis, we utilize the Babolat Racquet Diagnostic Center (RDC) the same way that the tour professionals’ technicians do to serve your needs. 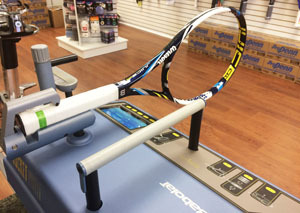 Come in today for a free diagnostic check of your racquet(s) and determine if you require customization, racquet matching, a new frame or if you have a counterfeit.